Higher Living Wages Somewhere, Maybe? $15 Per Hour, Unlikely! Labor DayLittle Rock A couple of days ago there was an article in the Times that examined the call by some fast food workers through their publicity strike for $15 per hour as their minimum wage. The reporters wrote of experts and economists being “flown to Las Vegas” for urgent strategy sessions on how any of this might be achieved now that the fast food workers are becoming a mini-Occupy blip on the media screen. They mentioned a return to the city-by-city living wage campaigns, mainly engineered and piloted by ACORN around the country. The article noted that none of this was getting much traction from McDonalds or the other mega-employers of lower wage service workers. So, what can really be done? So why hasn’t it been done already? Well, it would also take millions of dollars, and huge amounts of organizational ability. There’s no ACORN anymore of course, but ACCE, the successor to ACORN California, has skills and experience in this area, but… the real truth is all of this is hard and takes time to get the petitions, get on the ballot, and then try to win an election, long after the papers have yellowed and the tweets and Facebook photos have disappeared and most of the original fast food workers have changed jobs another couple of times. There’s no ACORN now, and since 2008 there haven’t been any statewide initiatives that I can recall to raise the minimum wage or local ones in California or elsewhere where it is legal with the sole exception of Albuquerque by an ACORN successor, OLE! And, the hard lessons we learned repeatedly in Denver and Houston initially on local elections and statewide in Missouri, all of which we lost, is that you can’t win elections city or statewide with what you want the minimum wage to be or something close to a living wage, but only with a figure that represents a raise. When we started winning, we also started polling, especially in statewide campaigns with different wage numbers, and taking the highest number to the ballot that had greater than 60% support. 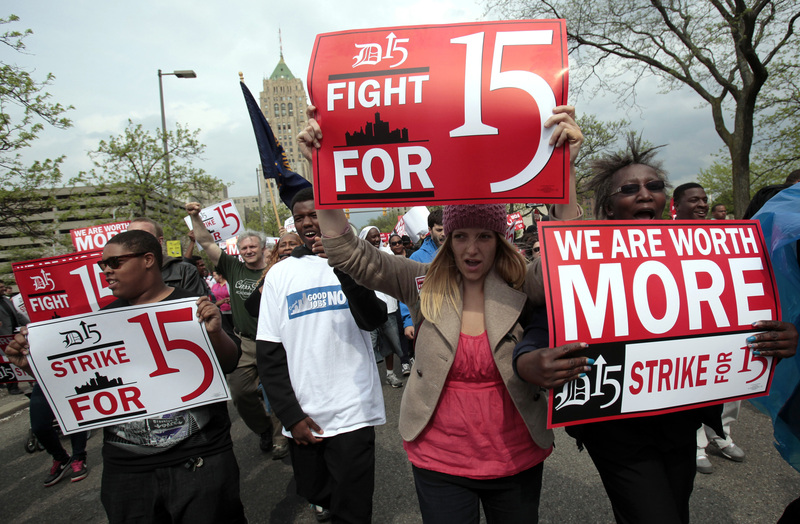 $15 per hour, forget about it, if you are going to the voters! We have to raise the minimum wage, and it matters to all lower wage workers and their communities desperately, but if there’s no movement from the employers and no real organizational or real worker pressure to force them to move, we have to find levels that are not rallying cries, but real benchmarks of progress where we have political support. God knows what the economists had to say on their junket to Vegas, but this is some solid advice based on painful experience and hard won victories that moved billions of dollars to millions of workers. It’s time to get to it! It’s all about LA, baby! Happy Labor Day! This entry was posted in Citizen Wealth, Organizing and tagged california, fast food workers' strike, living wage campaigns, SEIU by Wade. Bookmark the permalink.